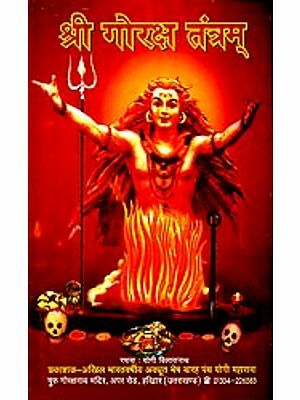 The name of Sarvãnanda of Mehãrpitha, one of the foremost Tãntrik saints of mediaeval Bengal, is a familiar word to every household in Bengal which claims to have some acquaintance with its past religious culture and traditions. 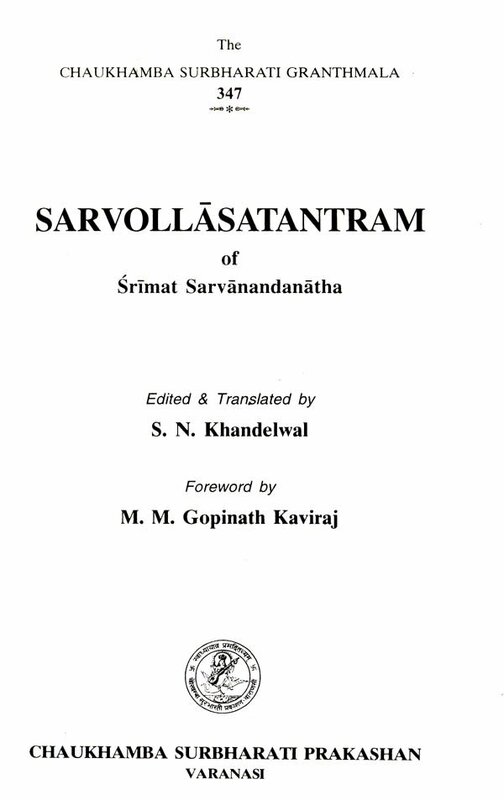 The following pages, brought out for the first time, represent a compilation by this saint of a big Tãntrik compendium in 64 chapters, called SarvollasaTantra, dealing with some of the most important topics of Tantrik Sãdhana, including those having a special bearing on Virasãdhana. 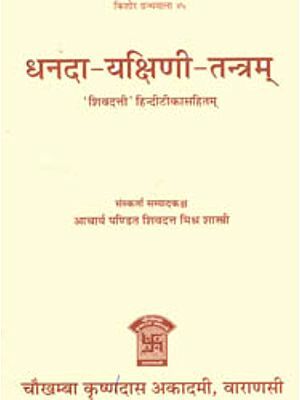 The publication of a work of this nature which was hardly known to any but a limited few can hardly fail to be welcome to all students of Sanskrit religious literature, to those in particular who are interested in the history of the religious culture of this country as well as to those who wish to specialize in various phases of all forms of Tantrik Sãdhana, Its appeal to practical students of the subject carnot of course be expected to be wide. 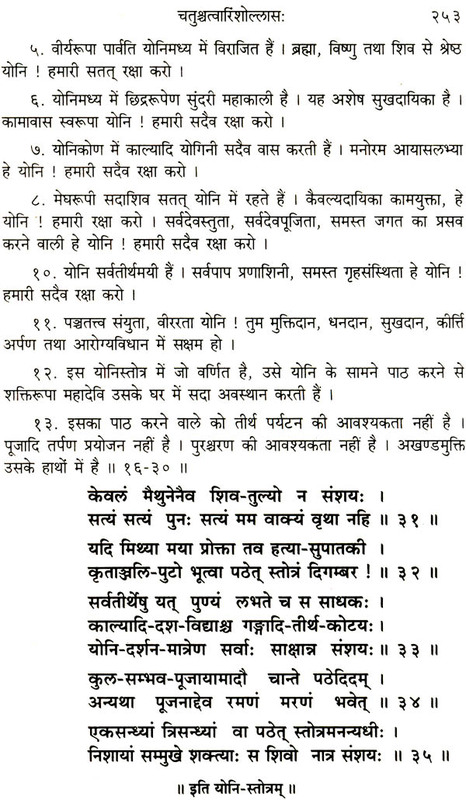 The work is based on a number of earlier Tantras, some of which are already known from other sources. 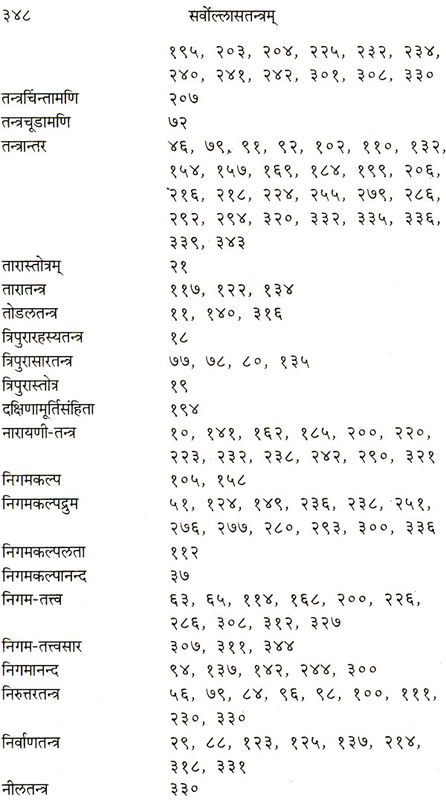 The reference to or enumeration of 64 Tantras is interesting, as it shows a different list from what is known to us. 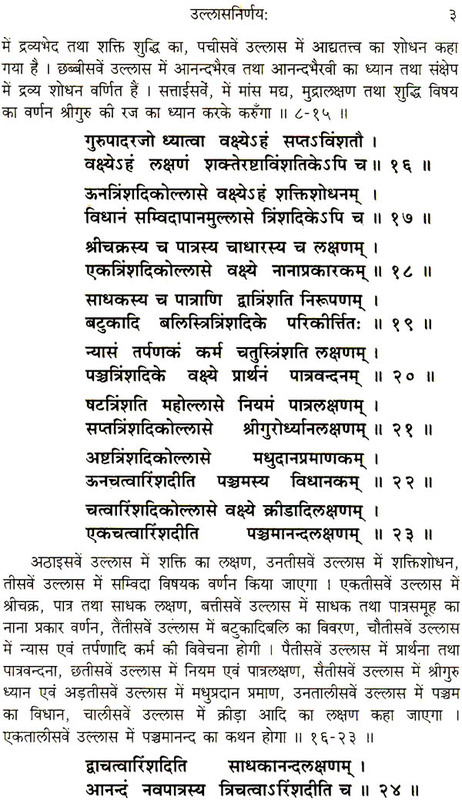 The Saundarya Lahari of Sañkaracharya refers indeed to 64 Tantras but does not name them. 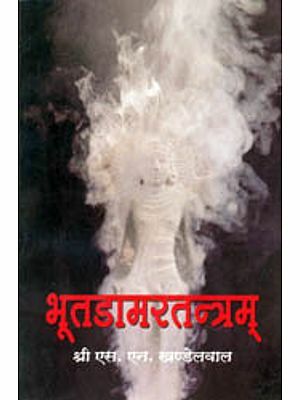 The commentator Laksmidhara however names and describes them all. 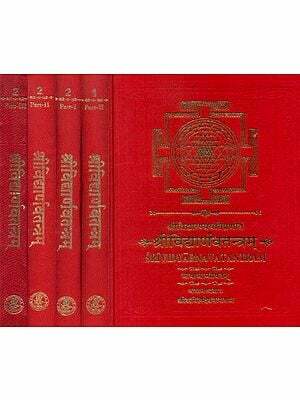 A Complete list is furnished by the Vãmakevara Tantra. 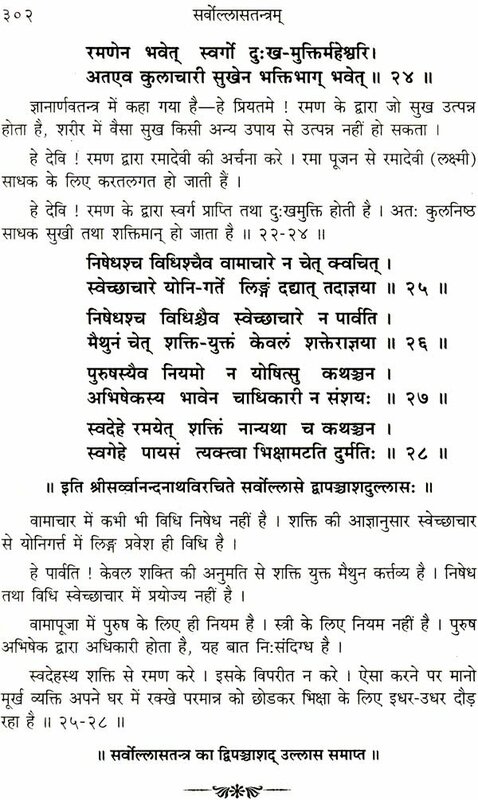 Another list of 64 Tantras is found in the so called Bhairava Agama supplied by Jayaratha in his commentary on the Tantrãloka. But this last list is to be distinguished from the above by the fact that the works named therein are all devoted to the teaching of monistic doctrines and are said to have issued from the southern mouth of Siva which is emblematic of the supreme unification of Siva and Sakti. 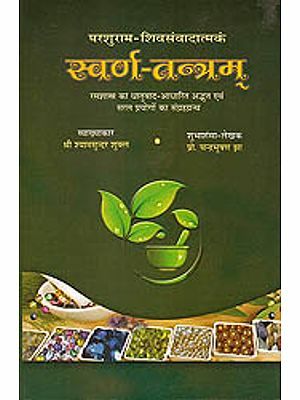 ‘A philosophical, rather mystico-esoteric, study of the various Täntrik modes of Sadhañã will naturally form part of a regular history of Tãntrik culture in this country. When that comes to be written in a systematic manner with all the attention it deserves, much of the obscurity which hangs round the subject owing to ignorance and misinterpretation will disappear, and the true significance of most of the fltes, however unintelligible or even fantastic any of them may seem to us at present, will appear clearly in the light of the proper perspective then revealed. 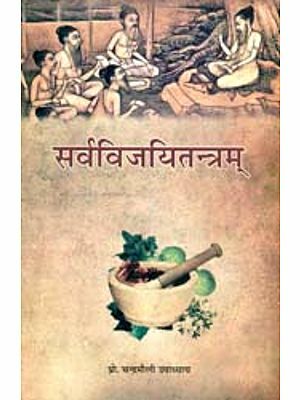 The first principles of these practices may then be found to be much more ancient and wide than they seem to be known , perhaps even more scientific and rational. 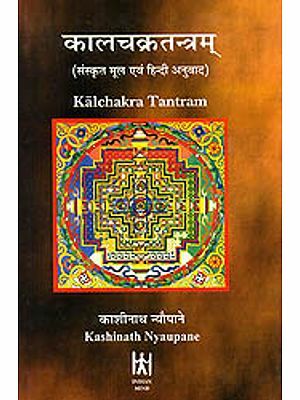 Practices and beliefs corresponding to those of the so-called äkta Tantras, exist in a more or less explicit form in numerous other religious sects of India, both ancient and mediaeval (and even modem), including the Buddhistic and the Jam. 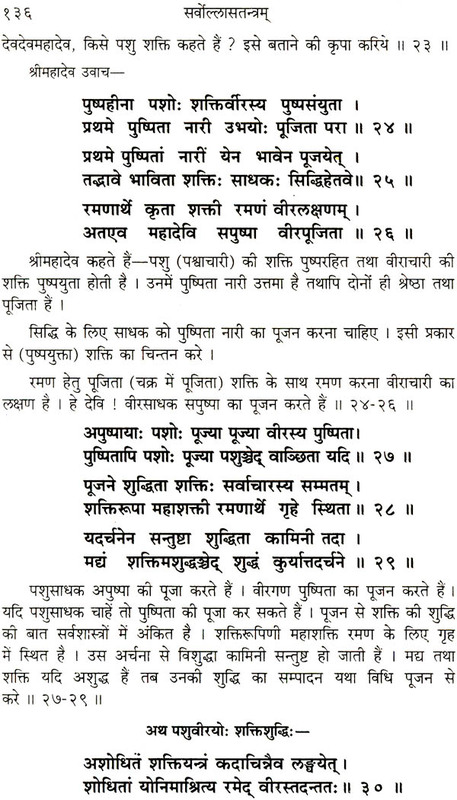 The essentials of the cult may perhaps be traced to the Vedic times [Cf. 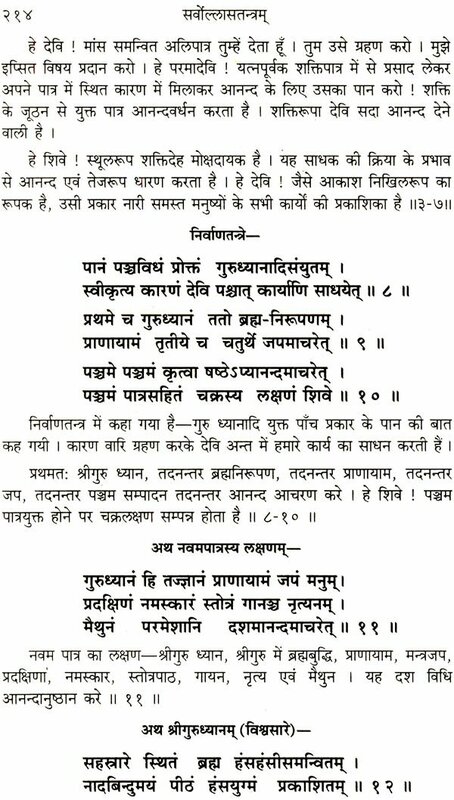 the Mahavrata rite. Every religious sect suffers from the stigma brought upon its fair name by the willful abuses and malpractices of its unworthy and perverted followers. 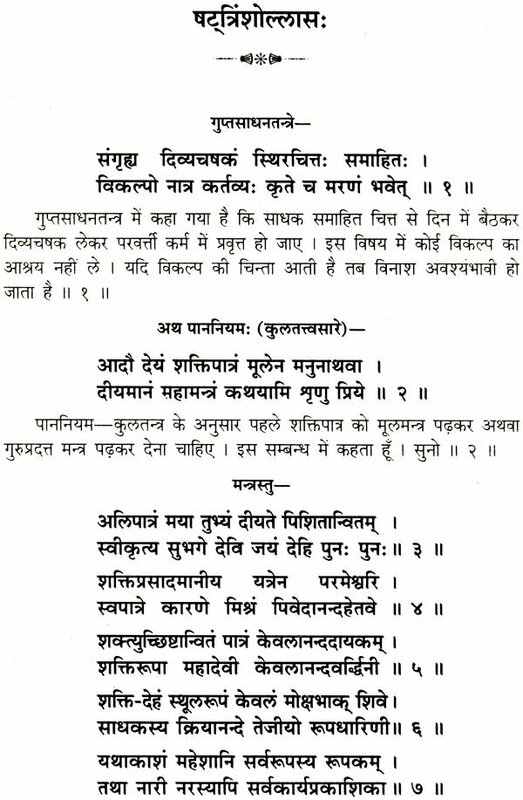 Its merit or intrinsic worth is not to be judged by these aberrations, but by the high ideal which it consciously sets up before itself and which is realized in practical life by some of its faithful adherents. 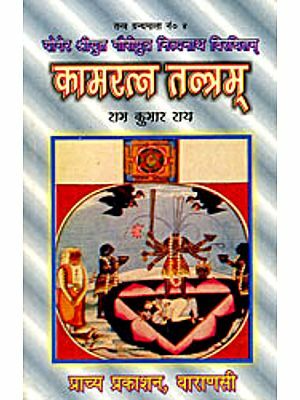 The philosophy of Kãmakalã is a study by itself. How the Transcendent Divine, the Ineffable Unity of the Supreme Being, brings forth as it were out of Itself and within Its own Nature the germ of the Cosmos lying hidden so long in Its undifferentiated unity is a problem to which the intellect of man finoks no convincing reply. 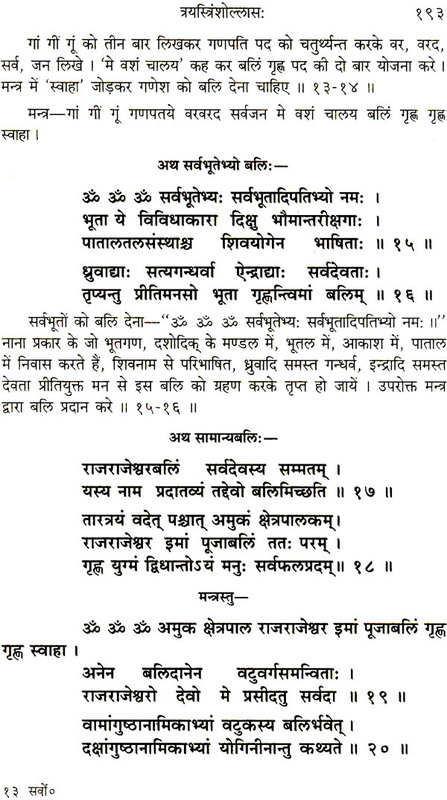 The Tãntriks however aver that the transition from Anuttara (Transcendent) to Ananda (Divine Joy) , and from Ananda to Ichchhã (Divine Will), if a transition it could be called where time-sequence or even logical sequence is meaningless, entails a corresponding transition back from Ichchhã to Ananda and from Ananda to Anuttara, Icchã represents the Divine Will involved in the mechanism of Kãmkalã and it presupposes the play of Ananda on a higher level. Ananda is the expression of the eternally self-aware Supreme Being acting upon Itself and looking into Itself as into a mirror. 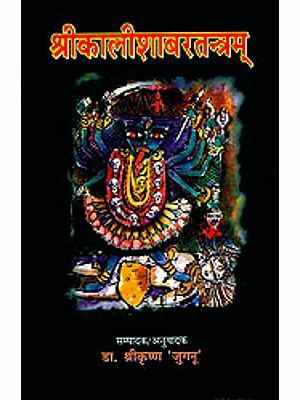 It does not belong to the Transcendent or to Anuttara as such nor to the Supreme Will either, which is at the apex of creation and is a descent from self-contained Existence. It represents the intermediate link as it were between, to use a Christian term, the Father Divine and the Son Divine, It is the Prajñäparamitã of the Neo-Buddhists and Mahãakti of the Täntriks. The relation of the Transcendent with this is that of the Self with its own nature. 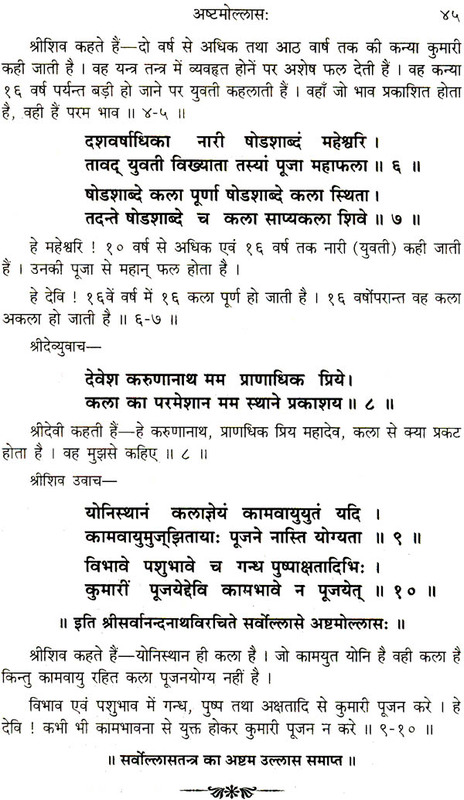 The Supreme Unity cannot be reached from the level of Will except through the manifestation of Ananda or Sakti. This Sakti, as a counterpart of Siva, has to function properly so as to induce the state of Supreme fusion in which both would be lost in the unity of Brahma. 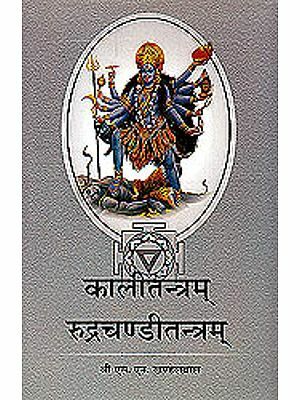 In other words, the awakening of Kundalini from a dormant state into the form of a Conscious Power and the consequent transmutation of Jiva into Siva, followed by their joyous unification in the Self-delight of Brahma, are duly recognised in the Tantras. 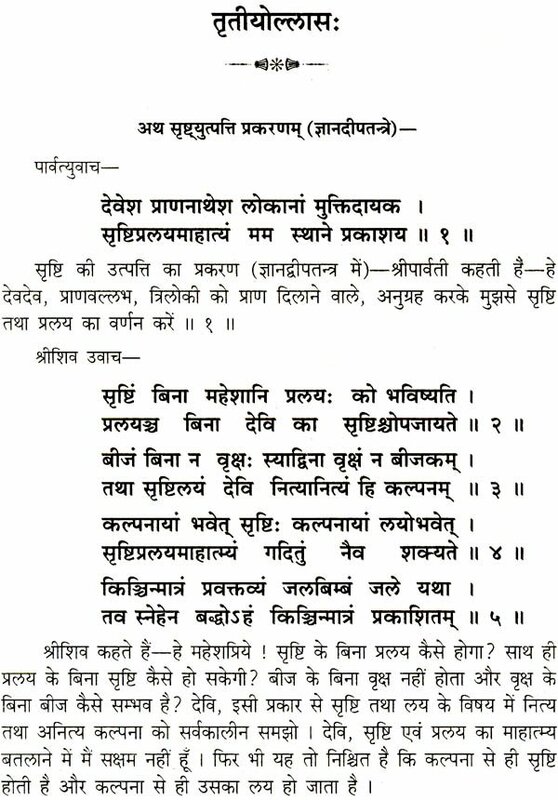 For does not the Vira Sadhaka, Who has risen above the limitatio of the disciplined moral life of a Pasu, find access to the transcendental glories and freedom of the Divya stage through a process of Sublimation accompanied by assimilation of Pure Sakti.